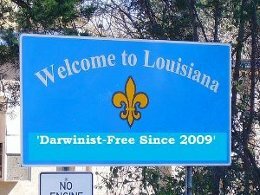 The state of Louisiana is doing everything it can to force feed its students creationism despite numerous constitutional restrictions that prevent religious activities in public schools. It also passed the Academic Freedom Act in 2008 which allows “science” teachers to teach creationism as a “theory” equivalent to evolution to students. Of course, I also discussed how Louisiana provides vouchers for students to attend private Christian universities, some of which use textbooks that think a real Loch Ness Monster disproves evolution. According to an article in the the Lafayette, LA Independent Weekly , the Louisiana Board of Elementary and Secondary Education considered a set of accountability guidelines for private schools at its July 24, 2012, meeting. Zack Kopplin, “an 18-year-old Rice University student best known for his efforts during the last two legislative sessions to repeal the Louisiana Science Education Act, was one of several people who addressed BESE recently in opposition of the controversial voucher program”, testified that of the roughly 6600 spaces available for students under the program, 1350 will be filled “at private Christian schools that teach creationism and peg evolution as ‘false science.’” Kopplin claims that Louisiana is about to spend almost $12 million to fund the teaching of creationism through this new voucher program that uses public school funds to pay for tuition and certain fees at private schools for students who attend low-performing public schools and whose family income is below 250% of the federal poverty level. It is impossible to prepare fully for such a massive reform as going voucher, and some undeserving private schools are bound to receive an OK from harried state officials. But a religious takeover on this scale cannot be accidental. Of the schools on Zack Kopplin’s list, one believes that scientists are ‘sinful men,’ and declares its view ‘on the age of the earth and other issues is that any theory that goes against God’s word is in error.’ Another avers that evolution is ‘extremely damaging to children individually and to society as a whole.’ A third tells students to write an essay explaining how ‘the complexity of a cell shows it must be purposefully designed.’ And so it goes. It is sad that a state uses taxpayer money to help teach students about the imaginary Loch Ness Monster to help them understand the pseudoscientific religious belief of creationism. via Vouchers for creationism in Louisiana? | NCSE.